Totally randomly out of the blue I got a message from a kid in Costa Rica who had found my 395 pics on Photobucket. I managed to work out from his poor english, my even worse spanish and google translate, that he wants to buy them. But thats another story. 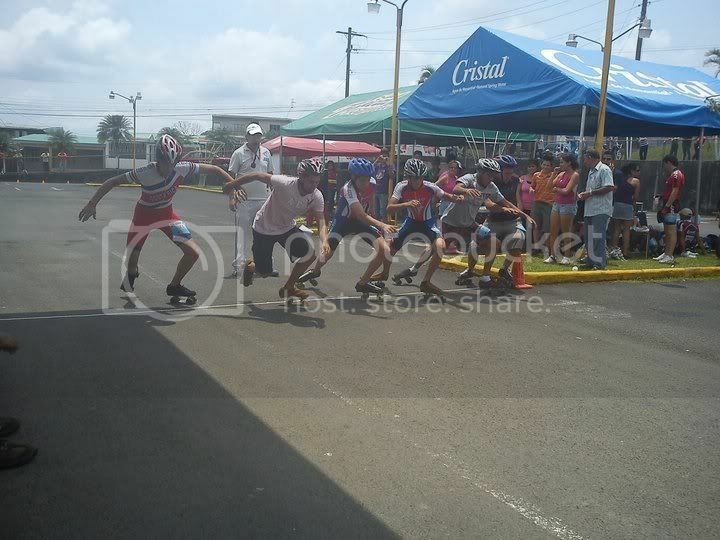 This pic is of him and other competitors in a quad speed race (all legit) in Costa Rica. He tells me Inline is much bigger over there. The amazing thing is these guys are all in their early to late teens! I tip my hat to them and he will be getting a good deal (after shipping ) on the boots for his dedication to what many consider a dying sport. Check out the mounts kids after my own heart. Bont QRC ,Boen speed 6, Boen Special 162. The short and forward Aussie mount great to see it all the way from Spain. Good to see young people still interested in quad racing! And good on you scuba for helping him out. When we see the mounts, we should rename the Short Forward Aussie Mount to Costa Rica Mount. Those are rearly shifted to the tip. The relationship between quad speed skating and inline speed skating is like the relationship between F1 racing and motorcycle racing. I like quad speed skating.